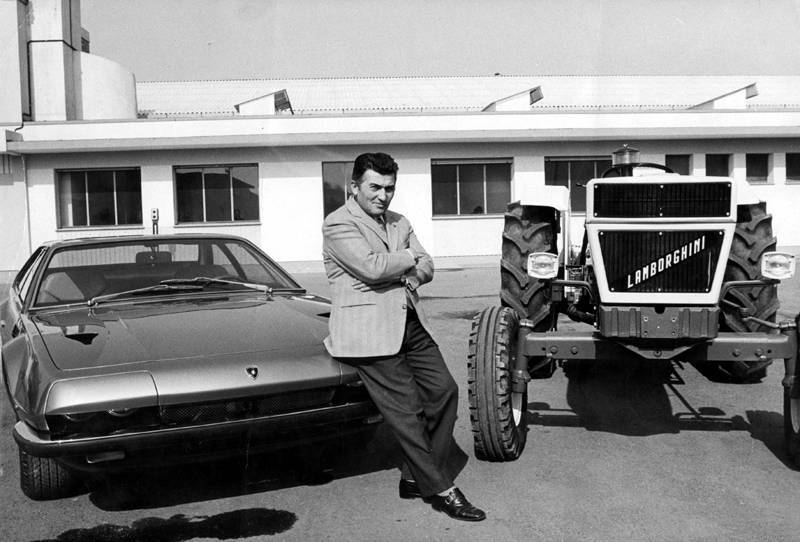 Today I found out the creator of Lamborghini S.p.A. originally owned a tractor company, Lamborghini Trattori S.p.A., which produced tractors from surplus military hardware. He decided to get into making cars as a result of frustrations he had with a Ferrari he had purchased which ultimately resulted in him being insulted by Enzo Ferrari, the founder of the famed Ferrari brand car company. Having always been interested in car engines, during World War II, Ferruccio Lamborghini served with the Air Force mechanics corps and became known as a wizard at mechanical improvisation and fixing engines. After the war, Ferruccio setup a small car and motorcycle repair shop in northern Italy. His first great business idea was to buy surplus military machines and convert them into tractors, which were in a great demand in the agricultural area where he lived at that time. In the beginning, from derelict military vehicles, Lamborghini was building on average one tractor a month. This business very soon became extremely successful allowing Lamborghini, in 1960, to expand his business to manufacturing oil-burning heaters and air conditioning units for buildings. As a car lover and wealthy entrepreneur, Lamborghini owned a number of sports cars, with the Ferrari 250 GT being one of them. At a certain point, Lamborghini became frustrated with problems he had with the clutch in his Ferrari. He then went to visit Enzo Ferrari. The world may have never had the famous Lamborghini super cars that were to follow had Enzo Ferrari not answered Ferruccio’s complaints with “the problem is not with the car but with driver!” and went on to advise him to look after his tractors instead. For a mechanical genius and Italian, this kind of answer was not only insulting but an open challenge. With millions of liras from his successful tractor business sitting around, Lamborghini decided to build his own car with a V12 engine and founded an auto factory in the small town of Sant’Agata. Lamborghini hired Ferrari’s ex-employees Giotto Bizzarini, Franco Scaglione, and Gian Paolo Dallara. The task was very clear – to create a luxurious and powerful GT that would reach 150 mph on the Autostrada del Sole, the famous Italian motorway which connects Milan with Naples. The result was the Lamborghini 350GT. The rest is history. Ferruccio Lamborghini used his birth sign, Taurus the bull, as a symbol for his cars. Moreover, most of the cars were named in relation to bull fighting or the famously bred bull: Muira – after Don Eduardo Muira, who was a bullfighting breeder; Islero – after a bull that killed the famous matador, Manolete; Espada – is a name of a sword, a weapon of a matador, etc. Ferruccio Lamborghini confessed that he never actually invented anything, rather, would simply copy and try to improve on others’ work. That is why, for example, he used the 12-cylinder motor of Ferrari, improving it with the twin cams from the 4-cylinder Alfa Romeo. Never had a clue! Very interesting stuff. Keep up the hard work. Love your website! – The bull’s breed is Miura. – espada means sword (not a kind of sword). Apart from that… cool story, bro. The official Lamborghini web site (http://www.lamborghini.com/en/home/) makes no mention of Mr. Lamborghini ever meeting (much less talking to or being derided by) Mr. Ferrari. You really think Lamborghini is going to give the hated Ferrari a free advert on their web site? Plus, you refer to the Lamborghini corporate web site – no good business EVER disrespects a competitor in such a place, even when true. I saw the lamborghini documentary on extreme machines and heard the same from the chief test engineer of lamborghini Mr. Valentino Balboni. Considering the fact that Mr. Balboni wasn’t associated with Lamborghini until 1968 (well after the founding of the company), he most likely didn’t actually see this event – meaning that his statement should be considered hearsay – just repeating what someone else (of unverified veracity) told him. I recently did a search on Google and I think the tractors are still around. They look very sporty as well. You can see the influence from his car designs in the sleek tractors. Both the Lamborghini cars and the Spanish bulls are Miuras, not Muiras.